Spring Cardio Workout Music Mix to help you get your sweat on. 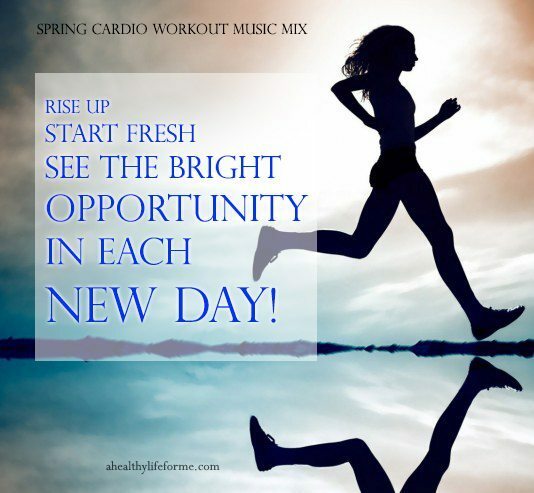 Whether you’re heading out for a Spring run, ride your bike or making moves back to the gym, let my Spring Cardio Workout Music Mix serve as your workout soundtrack because nothing makes a workout fly by like a fun, upbeat music list. With a perfect balance of hit songs, mixes, mashups that are upbeat and inspiring, this pop-funk-filled playlist will be your go-to mix all season long. I like to switch up my music to give me motivation and to give me a boost when I need it. Why is music so important for your workout? For example, a person’s typical stride rate while jogging or running is 150 to 190 strides per minute. Music BPM or Beats Per Minute can cause you to match the beats to the number of strides you take. Music has the power to lift your mood and beckon you on to keep your pace or quicken your pace. I tend to pick songs with a high BPM to help give me the boost I need to push myself out of my comfort zone. I am always looking for new songs to add to my playlists, so please share some of your favorite workout tunes with me and my readers. My Spring Cardio Workout Music Mix can be found on my Spotify profile below. You can listen to the mix, add it to your own playlist and follow me for free by setting up an account. Spotify is a free mobile, tablet, and computer digital music application that allows you to listen to others playlist and make your own.